The bass part for Tchaikovsky's Symphony No. 4 in F minor, Op. 36 has been edited by Paul Ellison, in-demand double bassist, professor, presenter, and former Houston Symphony Orchestra principal bassist of 23 years. Ellison's bowings, fingerings and other editorial markings have been added throughout the score. The Fourth Symphony by Piotr Ilich Tchaikovsky was written between 1877 and 1878 in dedication to his "best friend" and patroness, Nadezhda von Meck. The work is famous for its use of the "Fate" theme, represented by the opening fanfare. The theme would appear in later symphonies, albeit in different musical forms. Tchaikovsky Symphony No. 4 consists of four movements. 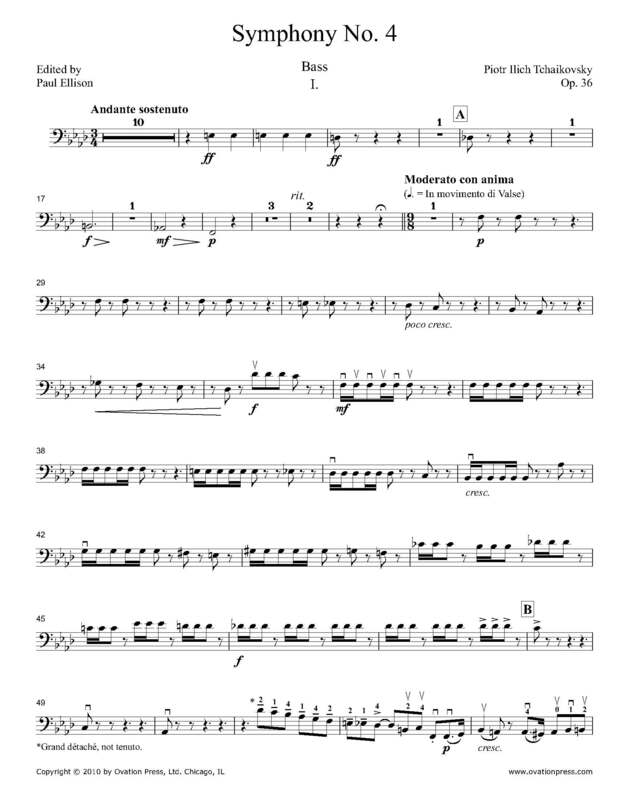 Download and print the score today to gain access to expertly edited Tchaikovsky Symphony No. 4 bass fingerings and bowings from Paul Ellison!